Ebbsfleet’s dramatic landscape and topography of chalk cliffs, river inlets, marshland, and its proximity to the Thames provides a unique opportunity to create a development that is characterful and distinctive. The River Thames and its estuary has throughout history been a vital corridor for trade, travel and industry. This landscape now contains a complex ‘palimpsest’ of landscape forms and features that have survived from prehistoric periods through to the modern day, influencing subsequent development throughout history. The map of the local area illustrated at the top of the page demonstrates the chalk escarpments in 1769, which have increased in extent over the last century; demonstrating how the landscape in this area has been dramatically altered. Local place names can be seen to have been derived from this topography. This study suggests that these place names, and also local Kentish landscape terms, can be used to define and influence the design and grain of new development areas, residential, mixed use and civic typologies. However, it should also be noted that the 'coombe' in 'Swanscombe' is most likely to derive from acorruption of the word ‘camp’ . The Domesday Book refers to ‘Suinescamp’, and in this instance, ‘camp’ is understood to derive from the Old English simply meaning a field or enclosed piece of land. * Words and places: or, Etymological illustrations of history, ethnology and geography, Isaac Taylor. ** The Place Names of Kent, Judith Glover. The geological strata diagram below also demonstrates these topographic features. The marshland and the Ebbsfleet river valley are clearly shown, as are the areas of chalk formations. 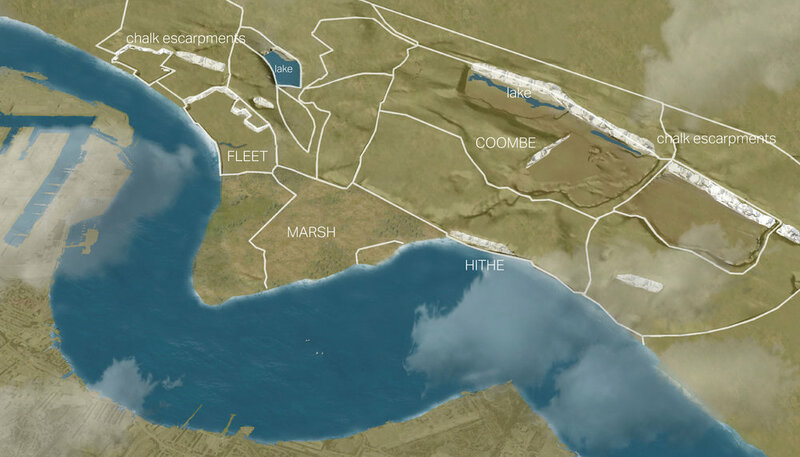 Prehistoric Ebbsfleet was open grass lands, with the river Thames previously flowing around 30 meters higher than today, through a broad flood plain with shallow wooded valleys. The distinctive beds of chalk are Sedimentary Bedrock formed approximately 72 to 94 million years ago in the Cretaceous Period. The local environment was previously dominated by warm chalk seas and these sedimentary rocks are shallow-marine in origin. They are biogenic and detrital, generally comprising carbonate material (coccolith). The diagram below shows the chalk cliffs in relation to: the water bodies; the Thames, the marshes, the remnants of the Ebbsfleet river and the lakes formed within the base of quarries; the private and public realm spaces across the Ebbsfleet area; and the chalk escarpments that have been created adjacent to existing settlements and rail and road corridors. The diagram reveals how the chalk cliffs (denoted in red) are so integral to the landscapes across Ebbsfleet, carving the city into defined areas, and forming a backdrop to most of the new neighbourhoods.